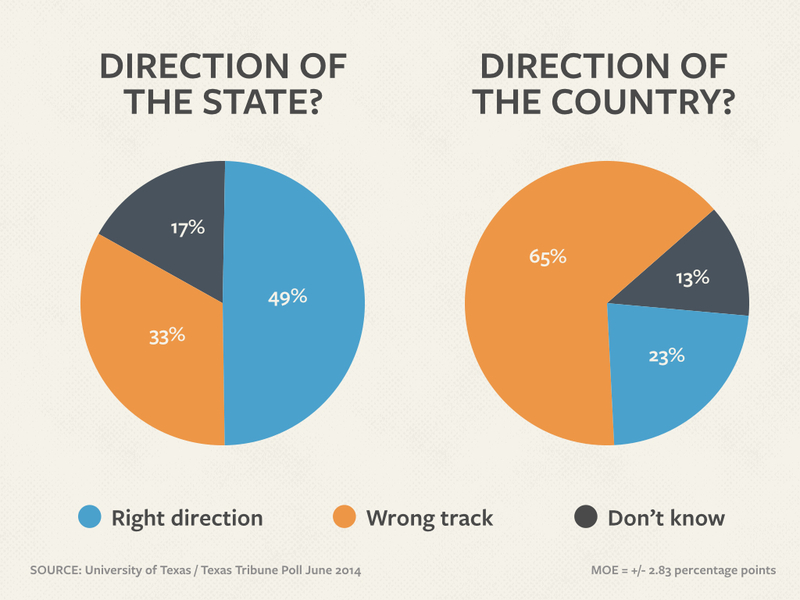 The president and Congress are remarkably unpopular in Texas, according to the University of Texas/Texas Tribune Poll. The president and the Congress are remarkably unpopular in Texas — and the disapproval of the federal officials is so strong that it could have some effect on this year’s elections in the state, according to the University of Texas/Texas Tribune Poll. Nearly half of the voters surveyed said they “strongly disapprove” of the job Barack Obama has done as president, and the same number gave that job grade to Congress. Combined with those who “somewhat disapprove,” 56 percent of Texas voters give the president bad grades and 72 percent disapprove of Congress. “In a red state where Republicans have a built-in advantage, it is very difficult for someone like Wendy Davis to run when you have a president who looks like a motivating device for the other side,” said Daron Shaw, co-director of the poll and a professor of government at the University of Texas at Austin. One difference in those federal numbers is that the president also has a little support, with 37 percent saying they approve strongly or approve somewhat of the job he’s done. Only 11 percent approve of Congress, and only 3 percent strongly approve. Gov. Rick Perry’s ratings almost glow in comparison, with 45 percent saying they approve of his work in office and 35 percent saying they disapprove. The voters hold more favorable than unfavorable views of most of their top candidates and officeholders. The biggest contrast found in the poll is between the candidates for governor: Republican Greg Abbott is viewed favorably by 45 percent and unfavorably by 25 percent; Democrat Wendy Davis is favorably viewed by 34 percent and unfavorably viewed by 40 percent. Put another way, Abbott's ratings are 20 percentage points more favorable than not, while Davis' are 6 percentage points more negative than positive. Henson said Abbott’s numbers weakened slightly with women and with Hispanics from the February UT/TT Poll to this one, but said the attorney general is maintaining overall positive grades with both of those groups. Two Democrats on the ballot — Alameel and Van de Putte — were unknown by the most voters: 63 percent either said they had a neutral impression or none at all about Alameel, a Dallas dentist and businessman, and 59 percent said the same about Van de Putte, a state senator. If the Tea Party were a separate political organization, 22 percent of the voters said they would vote for its candidate for Congress, while 20 percent said they would vote for a Republican in that situation and 38 percent would vote for a Democrat. One in five said they didn’t know which candidate would get their vote. The Tea Party has too much influence, according to 32 percent; too little, according to 28 percent; and just the right amount, according to 21 percent. The state is going in the right direction, according to 49 percent of the respondents, while 65 percent said the country is on the wrong track. And while 57 percent said the national economy is in better or the same shape as a year ago, 69 percent said the same about their families’ economic situations. 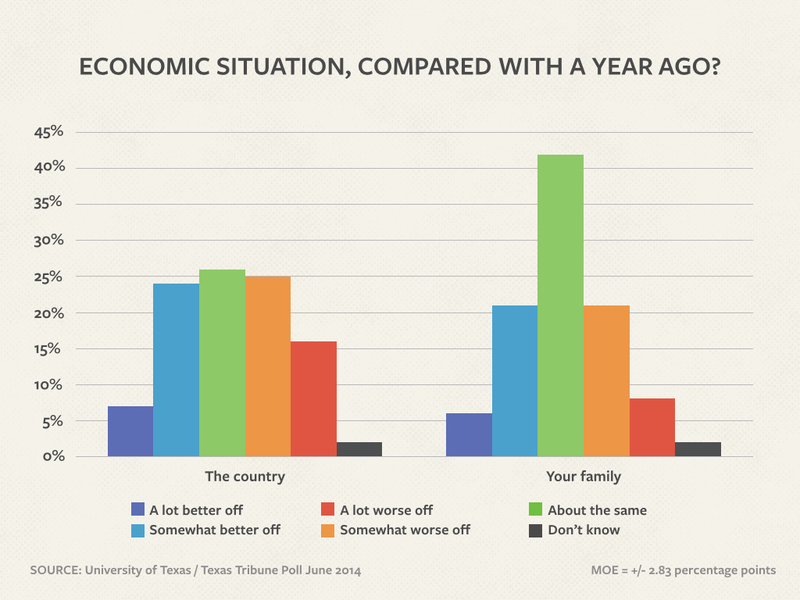 Two in five said the national economy is worse than it was a year ago, while 29 percent said that about their families’ situations. The University of Texas/Texas Tribune internet survey of 1,200 registered voters was conducted May 30 to June 8 and has an overall margin of error of +/- 2.83 percentage points. For this survey, we have shortened the time between polling and reporting the results to get a more timely measurement of sometimes rapidly changing public opinion. For questions of likely Republican primary voters, the margin of error is +/- 4.37 percentage points; for likely Democratic primary voters, +/- 4.75 percentage points. Numbers in the charts might not add up to 100 percent, because of rounding. This is the second of several stories on the latest University of Texas/Texas Tribune Poll. Yesterday: The statewide general election races and a peek at the 2016 presidential primaries. Monday: Which major party candidates for governor would do a better job on big issues, and the most important problems facing the state and the country.